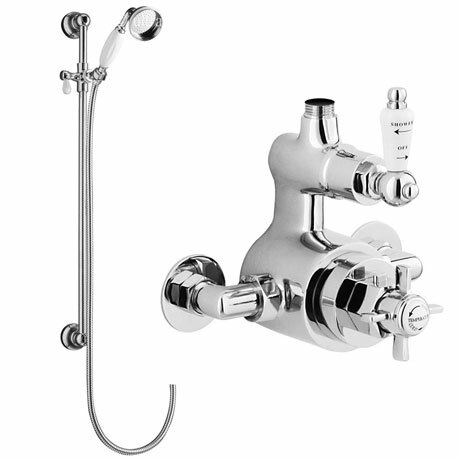 The Traditional Chrome Twin Exposed Thermostatic Shower Valve with slider rail kit from Ultra. The Traditional twin thermostatic shower valve is robust and graceful and this strength of design is equalled by the depth of choice of shower heads & kits. Suitable for all types of plumbing installation this shower valve has the added safety benefit of a built in anti scald device should the cold water supply fail. Traditional shower valves give a timeless elegance to any bathroom. The charm of yesteryear is recreated in the shower valve heads. A must for those wishing to make a classical bathroom statement. Q. Does this come wi the shower head? Will it be a powerful shower? Hi, this traditional thermostatic valve does come with the shower head. The power of the shower is down to the pressure of the system in your home, so different houses have different pressures that will affect the flow rate. Thanks! Smart looking, good quality shower kit. Works well and looks good in a traditional bathroom. Lovely product, looks great in our new bathroom. I really like the material I bought for my bathroom. Great quality and customer service from Victorian Plumbing..once again, never let me down!! I am very pleased with the quality of the material. And Victorian Plumbing delivers when they tell you so. There is a online competitor b...something.com, I will never touch with a barge pole! As for Victorian Plumbing, I will buy all my bathroom stuff from them. Thank you. - we love it. speedy delivery as well will shop with Victorian Plumbing UK again. This is our second one of these - the other is in our ensuite. Very, very pleased with it. High quality shower. The quality of this shower is excellent (as confirmed by the plumber) they provided excellent service, quality goods and an excellent price.